Wacking in at over 400 pages Modiphius’ Conan: Adventures in an age undreamed of is – in material terms alone – quite striking. It features excellent illustrations and its design and layout are superb. £34.99 may seem a little steep for just a core rulebook, but as the production values of RPG books have increased, so has their price. Indeed, Conan is a positive bargain when compared to the 7th edition of Chaosium’s Call of Cthulhu Keeper Rulebook which is going for over 40 quid at my local game shop. What we have to ask though is, not only is Conan a good game or not, but also is there enough of a game in it for it to become a regularly played game (thus warranting the price), or is it more of a ‘quite nice to play occasionally as a break from our regular RPG campaign’ sort of game? A danger of any fantasy RPG that is based on an established world or character is that they are often quite narrowly focussed, and players and GMs abandon them after a while in favour of more open, generic fantasy games that offer broader scope for adventures, such as D&D or Pathfinder. ‘Closed’ games can work very well and become huge successes: Call of Cthulhu is the par exemplar instance of this. But for every Call of Cthulhu there is an Empire of the Petal Throne and a Sky Realm of Jorune: games which in themselves were absolutely fine, but so immersed in their own game world that players often felt stifled by the milieu that was intended to bring the game to life. It’s too early to tell whether Conan has the legs and adaptability to become a long staying, frequently played game, but the reception it has had, particularly from older more experienced gamers, is very positive. The game’s greatest strength is that it evokes the atmosphere of Robert E. Howard’s Hyboria well- not just in its fast and deadly combat, but also allowing games to include treachery and intrigue in the barbaric and savage world of Conan. The sorcery and dark magical elements are also true to Howard’s fiction and, overall one does feel that one is playing a game set in Hyboria, rather than a generic fantasy RPG with superficial Hyborian window dressing. I’m also pleased to see that the game is based solidly on the stories written by Howard rather than those written by other writers who turned Hyborea into something of a fantasy franchise. Hyboria is presented in detail and everything about this background rings true and has a great authenticity that I defy even the most avid Howard fan to find fault in. The character classes – or rather archetypes – are similarly suitable to a Hyborean adventure: Archer; Barbarian; Mercenary; Noble Warrior; Nomad; Pirate; Priest / Priestess; Scholar; Scoundrel; and Witch / Shaman. These archetypes act as guides rather than templates for character creation and allow you to create your own adventurer and not just pick one from a menu of clichés. Interestingly, the archetypes allow you to create an adventurer that sits well in the Hyborian setting, but does not limit you to just playing a sullen eyed barbarian; devious merchants and conniving courtiers are just as possible to play in Conan. 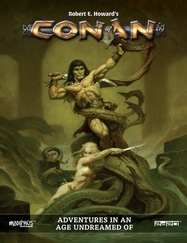 Conan utilises the 2d20 system as its game machine, a system that has served Modiphius well in other games such as Infinity RPG; Star Trek Adventures and Mutant Chronicles. This system not only works very well as a game mechanic, but in each instance it has been adapted to contribute to the atmosphere and verisimilitude of the respective game worlds, despite their radical differences. In Conan the 2d20 system really creates an atmosphere of brutal and savage combat and swashbuckling adventure: essential in a Hyborian setting. However, it is at this point I will raise my only gripe with Conan: Adventures in an age undreamed of. At times (and actually this is true of all the Mophidius games I have seen) the explanation of the rules is somewhat unclear. Even experienced games I have spoken to about Mophidius RPGs have raised this issue. If Mophidius could address this single, but important issue, and produce rule sets written with greater lucidity, then their games would be superb, whereas now they are merely excellent. In view of the very high standard of this game I eagerly await the release of the company’s next RPG: John Carter: Warlord of Mars. I have every confidence that Mophidius’ Barsoom will be as real and alive as its Hyboria. I just hope they’ve got over their ambiguous writing glitch by then. Power the radium canons!